This saijiki contains kigo about seafood and fish of all seasons. More haiku will be added later. They change their name as they grow larger.
. Sakana 魚　toys and amulets with FISH . The word seafood just like that is not a kigo. 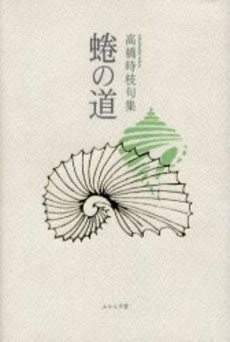 I will make a list here of the seafood that appears in the Japanese Saijiki and the ones we added so far worldwide. Since most of the seafood end up at the table, they are now included in the WASHOKU part of the World Kigo Database. This is a speciality of the Suruga Bay, Sagami Bay and a few others. They are a favorite in Miso soup or fried with butter. They live in the estuary of rivers, being saltwater clams. 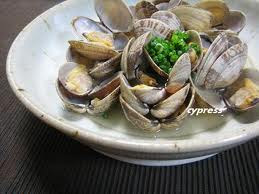 In Edo, many were harvested in the Sumida river by children in the morning and sold in the streets for the breakfast soup, like Shijimi clams too. The children were dressed in simple yukata with spotted patterns, wearing a short obi belt (sanshaku obi 三尺帯) for children, with a small tenugui 手拭い towel over the shoulder. stripped clams were often grinded and put into soup or salads. Looks similar to a hamaguri clam. baka means a stupid person. Since this clam has its foot hanging out, it looks like the toungue of a stupid person with his mouth always open. It is often prepared as tsukudani, but not as delicious as asari. speciality of Yamagata, also in sushi. Found in all rivers and sweetwaters of Japan. Its name comes from the black color of the shell. It tasts of mud and is not a favorite for food. shajuji, shamoji 杓子 is a spatula for scooping rice. Most haiku are about the sweetwater type found in rivers and wet rice fields. The shell has the thin, slight pink color of a cherry blossom. Often found along the beaches of the Inland Sea. Children love to collect it. Shijimi was very popular during the Edo period. Children would get them and sell them in the early morning hours for the shijimi miso soup and thus make a little pocket money. lit. "moon sun scallop", denoting the passge of time. Crab living in the shell of a conch. Vendors come from the sea towns to the big cities to sell their fare as an entertainment for children or food. I assume that the first two phrases are being spoken by the crab. Issa, rejected and scorned by many of the people in his own home village who took the side of his stepmother in his long and bitter inheritance dispute, envied the crab that carries home on his back. This hokku is from the second lunar month (March) in 1824. This was two months after Issa's last surviving child had died and ten months after his wife had died. In the hokku Issa reads the behavior of a land hermit crab and guesses what it seems to be implying (to ya) with its body language. The "hermit" part of the crab's name is not part of its Japanese name. Issa uses its venerable ancient name, pronounced with a long o in his time, although he probably knows its colloquial name, too: yado-kari, 'creature that borrows its house.' This colloquial name reflects the fact that hermit crabs borrow shells of various sizes to fit their own changing size as they grow larger, shells they can withdraw into when danger appears. Once they find a shell of the right size, they drag it around with them for protection as long as it fits them. Issa speaks politely to the crab, as if he were an honored human being, and he takes the crab to be telling him there aren't any villages that are or would be difficult for the crab to live in. The crab keeps his shell with him at all times, so he has no problem feeling at home wherever he is. Issa seems to be interested in the honored crab's advice, since he is in the opposite situation himself. 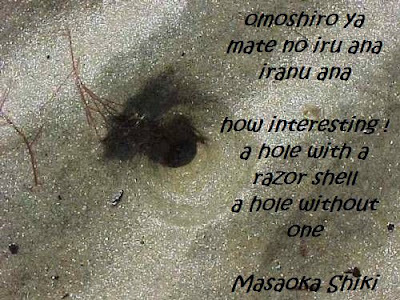 Judging by the tone of the hokku, Issa seems to imply that although he possesses no shell to help him forget the loss of his family and the coldness of most of his fellow villagers, he can appreciate what the crab is telling him. By this time he probably realizes he needs to develop at least a soft shell in order to remain in his hometown for the rest of his life -- his firm commitment. 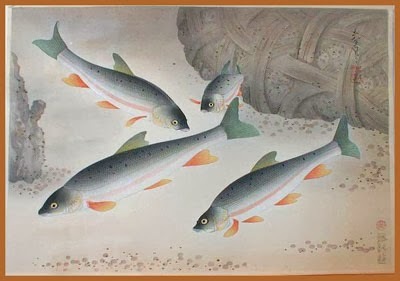 I will make a list here of the fish that appear in the Japanese Saijiki. Worldwide fish are listed separate. Since most fish end up at the table, they are now included in the WASHOKU part of the World Kigo Database.
. Toys and Amulets with FISH . In Western eyes, the delicately cut piece of food is often regarded as central to traditional Japanese cooking. The skilful use of the knife is indeed one of the most prominent features of the Japanese kitchen, and mastery of various cutting-techniques is a matter of course to the Japanese chef as well as to the ambitious homemaker. However, the origins of this focus on the knife as the most favored kitchen tool are not well understood. The search for these origins leads us back many a century to the world of classical and medieval Japan and to one of the least known of the Japanese arts:, the art of slicing the meats of fish and fowl. 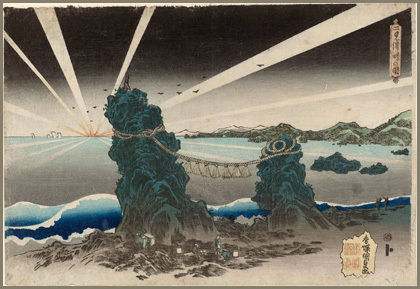 The first traces of this art are to be found in the classical or Heian period (794-1185 CE). 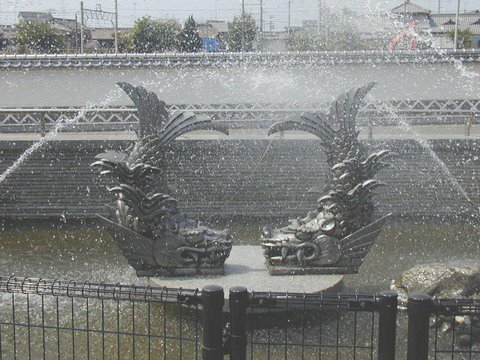 Heian Japan was a large aristocractic-bureaucratic state in which the court nobles held an unrivalled position as the political and cultural leaders. The core and center of their world was the capital Heiankyo (modern Kyoto), where the Emperor’s court and other spacious residences were situated There the nobles led leisurely lives, with their days dedicated to the refinement of various arts, aesthetic ideas, and pastimes, one of which was cooking.
. buna densetsu 鮒 伝説　crucian carp - all kigo and legends . blossom squid. BLOSSOM here refers to the cherry blossoms. He lives in the mud of flatlands, especially in the Ariakekai Ariake sea of Kyushu. Sparus species and sometimes also applied to "red snapper" Lutianus species. Literally the name means "Cherry Blossom Bream", because of the delicate pink meat. This one even carries the SPRING　春 in the Chinese character, composed of fish and spring. great numbers of pregnant fish coming near the shores in late spring, often followed by sea birds going for a bite. This refers to a group of small fish or individual fish types which live in rivers and lakes. They are scooped with a net and grilled or prepared in vinegar. Honmoroko from Lake Biwa is eaten in Kyoto as a very expensive fish. Now farmers in Tottori are growing it in old rice paddies and sell it to Kyoto, since the one's living in Lake Biwako are overpowered by foreign fish types, like Bass. 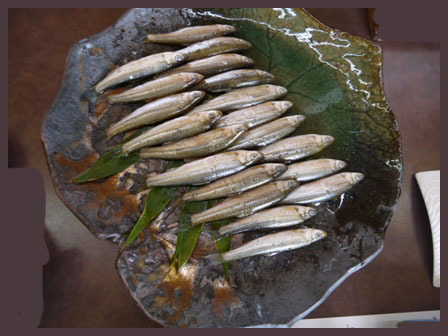 Inahata Teiko lists the moroko (minnow) as a speciality for March.
. 正岡子規　「寒山落木」Masaoka Shiki . Ikanago no Kugini is a famous tsukudani dish from Hyogo. The fish are only about 2 cm long. Many fish are found in other seasons too and have an entry of their own.
. Check the ABC KIGO index .
. Catfish Legends and Folk Toys . eboshiou, eboshi uo えぼし魚（えぼしうお）"eboshi fish"
Literally "mountain lady", "Mountain Maiden". ..... A great hobby of many anglers, seen commonly at the local rivers. Lives in the warmer waters of Southern regions, and is used as food in Taiwan. ..... Flying fish are a delicacy as raw sashimi in many costal areas. Also called AGO　アゴ in Kyushu. The little ones are dried or fried and some are made to broth (tobi-uo dashi 飛魚だし) for ramen soups. Best during the rainy season. 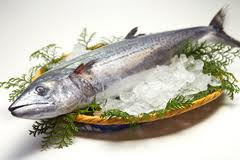 Most is caught in the near sea of Sasebo, Nagasaki and the Goto Retto Islands. a favorite food of Edo, where it was sold as fresh fish caught during the afternoon. They can be eaten whole, after taking the intestines and gills out. They live in many rivers of Japan and children like to catch them with their bare hands. They bring the feeling of coolness to haiku. 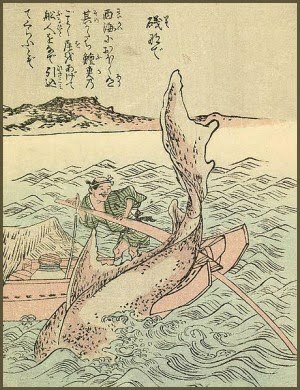 The DUGONG (Dugong dugon) has become a topic for haiku. The name is written with the characters for fish and happiness. Lives on the Pacific coast of Honshu and Kyushu. He has a strong skin and is a well liked delicacy. a small but most famous Benten Island near Kamakura. Autumn is not a good time for seafood kigo ! lit. 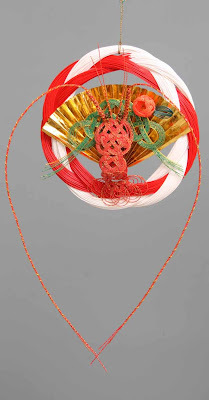 "eboshi-hat of a bonito, bonito's headgear"
Obanadako 尾花蛸 (おばなだこ) "pampasgrass octopus"
obana means the Japanese pampas grass, which blossoms along the beaches when the octopus fish appears in august and september. There are many kinds of octopus in Japan, which start laying eggs from july to september. After laying eggs, they loose their power and are not so nutritious for food any more. This is a rather sad kigo about the life circle of the octopus. crabs of the tarabagani family. They have many thorns on the legs and the back. They are bright red at birth already, but when they get dry the color changes to brown. When boiled, they change color to pink. They are caught from October to November. Speciality of Hokkaido and the Siberian sea coast. They are never fished in moonlit nights, because "the lobstes would see the nets and not be stupid enough to get caught!". They are a must on any festive occasion. The samurai of Kamakura saw an auspicious connection with their armour (yoroi) and the back shell of the lobster. They get the red color from the first sun at Futamigaura, in Ise, where the Gods reside. 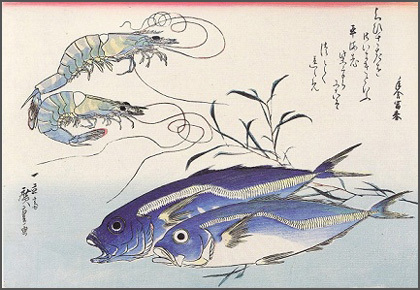 First named by Kaibara Ekiken (1603-1714), because most catch comes from the Ise area. ikizukuri, いきずくり　prepared while still alive, is common. Since they contain a lot of taurin, they are helpful in battling the summer fatigue at the beginning of autumn.
. New Year mochi with lobster decorations .
. ebi　えび　/　海老　/ 蝦 lobster, prawn, shrimp art motives . "Between the setting of the sun and the rising of the moon, there is a brief period of time when no light is in the sky, enough for his host to boil shrimp for his guests." Reichhold mentions that this was written at the home of Narihide at Katada. ..... izayoo tsuki いざよう月（いざようつき）"hesitant moon"
The moon shows up just a bit later than the full moon on the day before, as if it was hesitant (izayou, tamerau) to come back. Im Japanischen wird für eine Vielzahl von Krustentieren der Oberbegriff Ebi verwendet, der im Allgemeinen mit "Garnele" übersetzt wird. Die korrekte Übersetzung wäre der zoologische Begriff "Zehnfüßler", von denen allerdings Krebse oder Krabbe ausgenommen sind. Diese haben wiederum eine eigene Bezeichnung, nämlich Kani. Die am weitesten verbreitete Ebi-Art ist die maximal 5 Zentimeter lange Sakura-Garnele (Sakura-ebi, wörtlich " Kirschblütengarnele", in der Bucht von Suruga (Präfektur Shizuoka), wo sie in Sacknetzen gefangen und auf dem Sandstrand getrocknet wird. In der Küche wird sie sowohl roh als auch gegart verwendet: roh in "Kriegsschiff-Rolle" (Gunkanmaki), gegart als geschnitzeltes Tempura (Kakiage) mit Gemüse. Getrocknete Garnelen werden das ganze Jahr über in der Küche verarbeitet. Als typische Vertreterin der japanischen Gewässer bevorzugt die Geißelgarnele (kuruma-ebi, wörtlich "Radgarnele") die Sommermonate. Sie entspricht den im Handel angebotenen Shrimps oder Prawns. Ein wichtiger Fischereihafen für diese Garnelenart ist die Stadt Akiho in der Präfektur Yamaguchi. Neben natür­lichen Vorkommen gibt es in den großen Buchten von Tokyo, Mikawa und Ariake viele Zuchten für Geißelgarnelen. Seit jeher ist diese Garnelenart eine der beliebtesten Meeresfrüchte für die japanische Küche. Nicht umsonst wird sie in Japan als "segensreiches Produkt des Meeres" (umi no sachi) bezeichnet. Die Graugarnele (Shiba-ebi) ist eine Unterart der Geißelgarnele. Von Oktober bis Januar wird sie an den Küsten von Niigata, Westjapan, und in der Bucht von Tokyo gefangen. Trotz ihrer geringen Größe ist sie äußerst wohlschmeckend. Meistens wird sie als Tempura auf Sushi-Reis verzehrt oder zusammen mit in Streifen geschnittenem Gemüse frittiert. Langusten (Ise-ebi, wörtlich »Ise-Garnele«) werden bis zur Zubereitung im Restaurant in einem Aquarium gehalten, um Frische und Wohlgeschmack zu garantieren. Das kräftige Rot nach dem Kochen verheißt Glück und deshalb ist die Languste wichtiger Bestandteil von Festmenüs. Der in den Langusten enthaltene hohe Anteil an Taurin hilft dem Körper im Herbst die "Sommermüdigkeit" des langen heißen japanischen Sommers zu ueberleben. Langusten werden in Stellnetzen gefangen – in den Nächten um Vollmond ist der Fang allerdings untersagt. Diese Kaltwassergarnele (Ama-ebi/Botan-ebi, wörtlich "süße Garnele" "Pfingstrosen-Garnele"
hat in den Wintermonaten Hauptsaison. Zu dieser Zeit hält sie sich in den Küstengewässern von Hokkaido und Nordjapan auf. Im kalten Meerwasser benötigt sie über fünf Jahre, bis sie mit bis zu 10 Zentimeter Länge ausgewachsen sind. Trawler fischen sie in einer Meerestiefe von 200 bis 400 Metern, ihrem bevorzugten Lebensraum. Diese Garnelen schmecken am besten als Sashimi oder auf dem handgeformten Nigiri-Sushi, wo sie geshaelt, aber mit intaktem Schwanzstück auf dem Reis liegen. Am Schwanzstück wird die Garnele in die Hand genommen und vor dem Verzehr in Sojasauce oder einer anderen Sauce gedippt. Sie kann durch die Eismeergarnele ersetzt werde. Der Flusskrebs (kawa-ebi) hat indes im Sommer seine beste Zeit. Sein Vorkommen ist ein Zeichen für die Güte des Flusswassers. In ganz Japan ist es ein beliebter Sport der Kinder, die Tiere mit der Hand zu fangen. Diese Garnelenart findet sich von Hokkaido bis Kyushu .. Schreibweise in allen Kapiteln vereinen ... in allen Flüssen, Seen und Brackwassergebieten. Frittiert und mit Zitrone beträufelt gelten sie als einfacher und wohlschmeckender Snack.